The overall objective of the SPAWET project is to improve the characterization and modelling of lakes and groundwater buffering impacts based on the use of future SWOT data. For that purpose, we propose to develop and apply advanced and complementary hydrological models and to explore the potential of SAR altimetry for enhancing their performances. These developments will therefore improve the overall simulation of the hydrological cycle through a better quantification of lake evaporation and groundwater contribution to river discharges. To this end, we use state-of-the-art hydrological models to simulate the hydrological response of two regional hydrosystems (the Seine and the Loire basins), as well as some specific subsystems like reservoirs or alluvial plains. The simulated hydrological response will form the basis of synthetic SWOT observations generated by the SWOT scientific simulator developed at JPL (computation kernel)	and	CNES/LEGOS	(executing	environment)	on	selected	sites/regions	particularly instrumented or documented. These tasks will help to understand and document the model and observation errors and prepare the assimilation issues addressed in SPAWET. Finally, a complete 3 -yr SWOT-like dataset will be simulated by the simulator for the whole Seine river-alluvial plain system in agreement with the mission goals (~2000 km, cf. Figure 1). The analysis of this unique dataset will allow us to perform a distributed baseflow separation of river discharges through the definition of new separation algorithms. These algorithms may be used at the end of the mission to post -process the full mission dataset, hence providing a unique worldwide estimation of groundwater contribution to river systems. Figure 1. Location of the 5 reservoirs studied on Seine river and daily depth variations on the period (2000-2007). We indeed propose to work as a first step, on the Loire and Seine river basins where our consortium has strong expertise and databases, but other sites will be defined in collaborations with our partners addressing similar issues. Larger scale studies will be also performed at the end of the project, at least at the national scale on the French main river network. Indeed, a fine scale hydrographic network including the human influence on the river network will be set -up and integrated in a routing river model at the France scale (about 200 m resolution and 1 million river cells which will pose computational issues), and will be coupled to hydrogeological models. It is expected that the explicit representation of the small rivers in the water basin head will spread to the larger ones. Eventually, the methods and models developed will allow a better understanding of hydrological processes at regional scales in a human-influenced context. The global land surface model ORCHIDEE developed at IPSL, which is a land surface physically-based model used in the global climate model LMDZ and the WRF regional atmospheric model version developed at LMD. The CaWaQS model developed at Mines -PT, which is an integrated model designed for large basins and which couples several existing models, especially hydrology and groundwater flow. The GRSD model developed at IRSTEA, which is a parsimonious semi -distributed conceptual model designed for flow simulation. Two river basins (Seine, 74 000 km2 and Loire, 120 000 km2) will be especially studied, to take advantage of previous works and specific instrumentation installed. In addition to the simulation of the alluvial plains of the two basins, studies will be performed at the local scale. The local scale sites correspond to La Bassée, the four main reservoirs of the Seine river as well as the lake of Grand-Lieu in the Loire bas in which covers an area ranging between 35 and 65 km2 according to the season. The hydrological objects considered on these sites are large enough to be monitored by remote sensing data. The SPAWET project is organized around four Work-Packages (WP) focused on model developments, database collection, synthetic observations generation and data assimilation, all following the overall objective of quantifying the contribution of SWOT data, to the simulation of water and energy transfers in the Seine and Loire basins. Therefore, WP1 is dedicated to the development of lakes/reservoirs modules in our hydrological models while WP2 is focused on groundwater (GW) — surface water (SW) interactions in alluvial plains. The aim of WP3 is to develop the databases necessary for model developments, validation and for the assimilation studies. It then integrates the tasks of generating SWOT pseudo -observations on the lakes/reservoirs of the Seine and Loire catchments, on the La Bassée alluvial plains as well as on a portion of 200 km of the Seine river upstream and downstream Paris megacity. Finally, WP4 deals with data assimilation of observations (actual and synthetic) gathered in WP3, in the simulation tools developed in WP1 and WP2. Our first developments were focused on the Seine basin and on the tasks related to model (WP1) and baseflow separation algorithm (WP2) developments as well as data collection (WP3) on our studied sites. Data assimilation works will start in fall 2017 after the generation of SWOT pseudo - observations on the Seine reservoirs, beginning by the Orient 's lake (area 23 km2, depth range 18m) and a Seine river portion. In ORCHIDEE, we choose to model the energy and water budgets of lakes following the F Lake approach (Mironov et al., 2008) widely used in the meteorology /climate community. The implementation has been done in a multi -tile version of ORCHIDEE, considering the area fraction of each type of land cover in the grid cell and resolving the specific water and energy transfer equations on each entity. 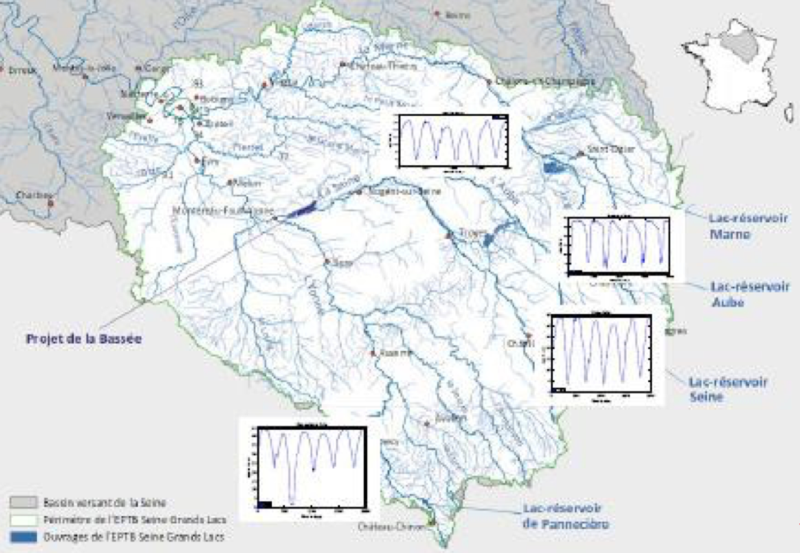 The model was first tested at local scale on the five largest reservoirs of Seine river (Pannecière lake on the Yonne tributary, Der-Chantecoq on the Marne river, Temple and Amance on the Aube river and Orient on the Seine river, see Figure 1). Preliminary sensitivity experiments to the lake depth were performed and Figure 2 presents for the deepest lake of Pannecière, t he maximum errors up to 8°C which could be done on the surface temperature linked to errors in the prescription of the lake depth. Resulting errors on latent and sensible heat fluxes are up to 100 W/m2. Even though lake depth was shown to be the most influent parameter on surface temperature, water turbidity was also found to be significant in the sensitivity experiments. These results reinforced the idea of the future combined use of multispectral space data to calibrate model parameters (solar and thermal data). Figure 2. 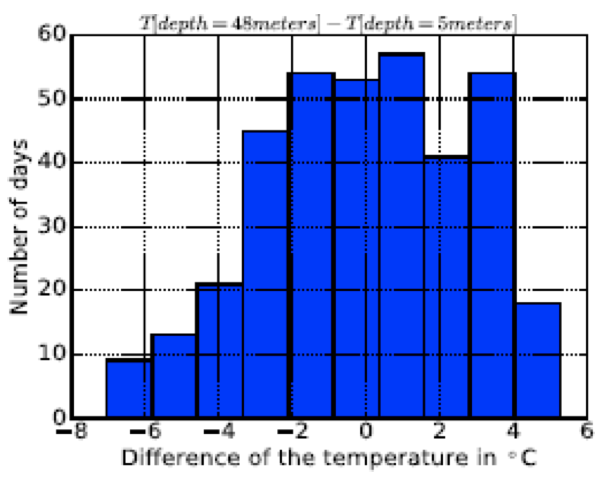 Impact of lake depth prescribed: simulated differences in Pannecière lake surface temperature for a maximum depth of 48 m and a minimum value of 5 m. The analysis concerns the whole year 2000. The GRSD model (Lobligeois et al., 2014) couples parsimonious hydrological modules and a simple routing scheme to simulate flows in the hydrographic network in a semi -distributed mode. Issues related to calibration strategy, parameter identifiability and spatial consistency is a first task which needs to be address for robust performances (de Lavenne et al., 2016). Then following the work of Payan et al. 2008, a new module will be introduced in GRSD in order to consider the influence of the dams. This implementation will be based on new input data which is the water volume stored by the dam. These times series are then directly used by one modelled sub -catchment where a dam is located. It does not require any additional parameter, but it relies only on this new input data that the SWOT simulations could help approximate along with in situ observations. In most of the sedimentary basins in temperate regions, the discharge at the outlet of the basin is composed by a significant amount of groundwater. For the Seine river, this contribution is around 30% (Flipo et al., 2014; Pryet et al., 2015; Labarthe, 2016). In 2016, the exchanges between stream and aquifers were quantified along the Seine river network (14000 km, Labarthe, 2016) and the Loire river network (5000 km, Baratelli et al., 2016) with a spatial longitudinal resolution of 100 m to 1 km. Those simulations were performed with EauDyssée and its newer version CaWaQS2.0 (Labarthe, 2016). Alluvial plains are also implemented in the Seine basin model. Moreover, the river-aquifer exchanges were quantified at the Loire basin scale, as well as the associated main sources of uncertainties (Baratelli et al., 2016). This work highlights the major control of river stage fluctuations and river bed elevation on the exchanged water flux between rivers and aquifers. Figure 3. Influence of water level fluctuations on river-aquifer exchanges at the Loire basin scale (from Baratelli et al., 2016). The SWOT mission will contribute to improve the performances of distributed coupled hydrological - hydrogeological models. 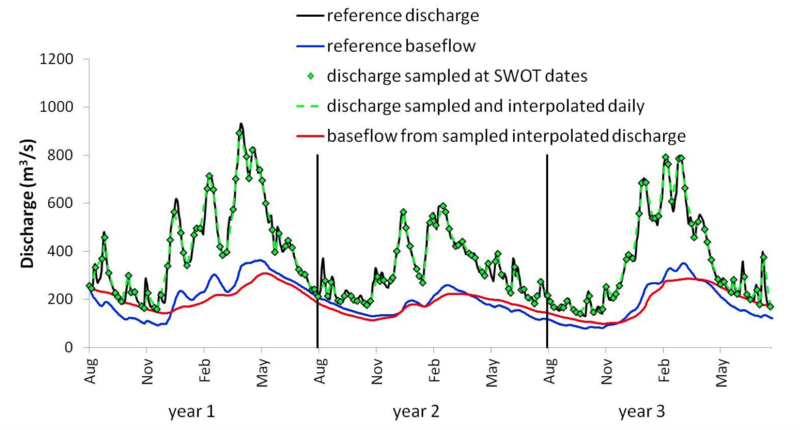 Using filters to analyse hydrograph recession curves, it is possible to quantify the groundwater contribution to river discharge by a baseflow separation method (Chapman, 1999). We performed the separation based on the simulated daily water exchanges at the scale of the Seine basin. The first results indicate that it should be possible to retrieve groundwater contribution to the river baseflow over the life time of the SWOT mission on the Seine basin. Figure 4. Baseflow estimates in the Seine basin over the 3 yr duration of the SWOT mission. Baratelli, F., Flipo, N., Moatar, F. (2016). Distributed quantification of stream-aquifer exchanges at the regional scale: sensitivity to in-stream water level fluctuations, riverbed elevation and Manning coefficient. Journal of Hydrology. 542, 686-703.. doi:10.1016/j.jhydrol.2016.09.041. Chapman, T. (1999). A comparison of algorithms for stream flow recession and baseflow separation. Hydrological Processes 13:701–714. Durand, M., Gleason, C.J., Garambois, P.A., Bjerklie, D., Smith, L.C., Roux, H., Rodriguez, E., Bates, P., Pavelsky, T., Monnier, J., Chen, X., Di Baldassare, G., Fiset, J-M., Flipo, N., Frasson, R.P.M., Fulton, J., Goutal, N., Hossain, F., Humphries, E., Minear, J.T., Mulkowe, M., Neal, J., Ricci, S., Sanders, B., Schumann, G., Shubert, J., Vilmin, L. (2016). An intercomparison of remote sensing river discharge estimation algorithms from measurements of river height, width, and slope. Water Resources Research, 52, 4527--4549. doi: 10.1002/2015WR018434. Flipo, N., A. Mouhri, B. Labarthe, S. Biancamaria, A. Rivière, and P. Weill (2014b). Continental hydrosystem modelling : the concept of nested stream-aquifer interfaces. Hydrology and Earth System Sciences 18:3121–3149. Labarthe, B. (2016). Quantification des échanges nappe-rivière au sein de l'hydrosystème Seine par modélisation multi-échelle. MINES ParisTech, PSL Research University. Lobligeois, F., V. Andréassian, C. Perrin, P. Tabary and C. Loumagne (2014). When does higher spatial resolution rainfall information improve streamflow simulation? An evaluation using 3620 flood events. Hydrol. Earth Syst. Sci. 18(2): 575-594. Mironov, D.V. (2008). Parameterization of lakes in numerical weather prediction. Description of a lake model. COSMO Technical Report, No. 11, DeutscherWetterdienst, Offenbach am Main, Germany, 41 pp. Payan, J.L., C. Perrin, V. Andréassian, C. Michel (2008). How can man-made water reservoirs be accounted for in a lumped rainfall-runoff model? , Water Resour. Res., 44, W03420, doi:10.1029/2007WR005971. Pryet, A., Labarthe, B., Saleh, F.,Akopian, M., and Flipo, N. (2015). Reporting of stream-aquifer flow distribution at the regional scale with a distributed process-based model, Water Resour. Manage., 29, 139-159. doi: 10.1007/s11269-014-0832-7. de Lavenne, A., G. Thirel, V. Andréassian, C. Perrin, M.-H. Ramos (2016). Spatial variability of the parameters of a semi-distributed hydrological model. Proceedings of the International Association of Hydrological Sciences.